Episode 119: The Preacher and the M.Div. 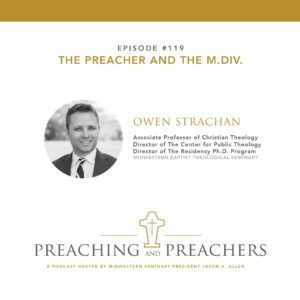 This week on Preaching and Preachers, Dr. Owen Strachan joins me for a recurring guest host episode where he interviews me on some aspect of preaching. Today’s discussion is on the preacher and the M.Div. Dr. Strachan serves as Associate Professor of Christian Theology, Director of the Center for Public Theology, and Director of the Residency PhD Program at Midwestern Seminary. A brief introduction about Dr. Allen’s article on the primacy of the M.Div. The benefits of completing the M.Div.